My mother would make us, as she called them "one-eyed sailors," frequently as a child. They are also called "egg in the basket" or "egg in the hole;" simply an egg fried up in a whole within a slice of bread. Cooked up very much like a grilled cheese sandwich. "One-eyed sailors" still remain in my breakfast repertoire. Once I was diagnosed with Celiac, I just switched to gluten-free (GF) bread. That easy. As far as the hole in the bread, I use a butter knife to cut it out after thawing for a few seconds in the microwave. A cookie cutter of any shape or the rim of a glass will work, just make sure to keep the edges of the bread intact. I always have a tub on washed baby spinach in the fridge and like to add into my meals wherever possible. After cooking up my one-eyed sailor, there's all that good stuff in the skillet and in the amount of time it takes to saute up some spinach is the same time that it takes for the one-eyed sailor to cool to a bit. This favorite breakfast of mine takes 7 or 8 minutes tops to make. It takes longer to eat it than to cook it. Prepare the bread: if using frozen bread (like most GF breads), thaw in microwave for 20 seconds. Cut a hole in the center to accommodate for an egg using without cutting in to the edges a butter knife, the rim of a glass, cookie cutter, or biscuit cutter. Heat a medium/large skillet over medium heat. Add in butter/fat/oil of your choice. (My personal favorite is rendered bacon fat, but anything will work.) Melt and swirl to cover entire surface of skillet. Place the cut-out bread and the bread hole in the center of the skillet. Press down the edges of the holed bread before cracking egg into it. This should prevent the egg white from running out of the edges. 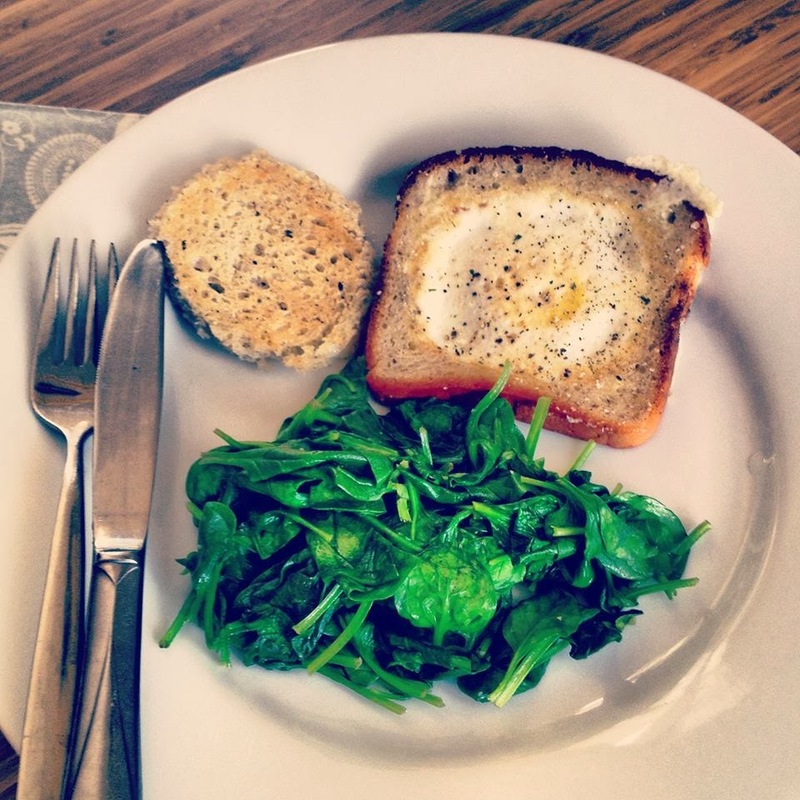 Sprinkle some garlic salt (or any salt or seasoning) onto the egg and bread pieces. Once it has set and white on the bottom of the egg, flip over both pieces. Cook the other side for the same amount of time. I prefer mine somewhere between over easy and over medium. Remove from skillet onto plate. Return skillet to heat and throw in spinach and saute until wilted with stirring. Add in salt, seasonings, pepper to taste. Should take no longer than 2-3 minutes. Serve on plate with the one-eyed sailor. Grind some black pepper on top, as desired. Eat immediately and enjoy.